As you can imagine, Jonah’s outburst earns him a smack across the face, along with a threat of worse punishment if he dares to lash out again. Thus is the source of Jonah’s desire to save that little girl’s pet from the same fate, though he can’t seem to flush out any game either. 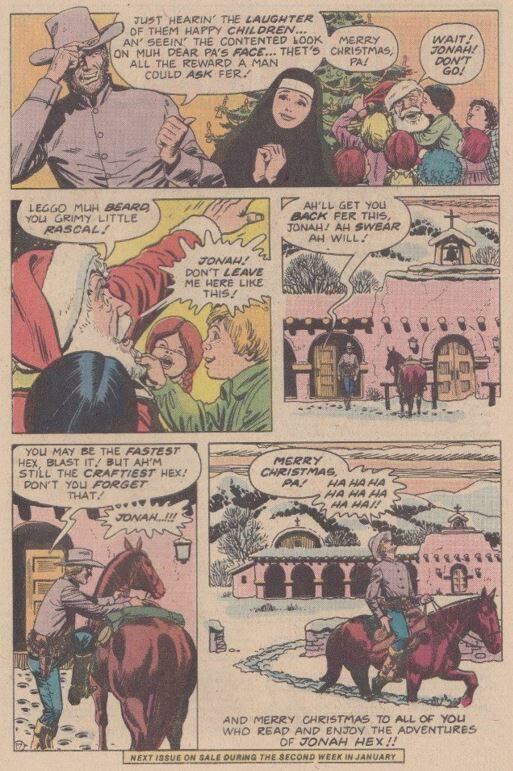 On a lark, he decides to follow a bright star in the sky -- an element used throughout the Super-Star Holiday Special -- and it leads him not only to the outlaws he was looking for, but after Jonah wipes them out, he recovers the provisions they were toting, thereby saving the fawn’s life with a knapsack full of hardtack and beef jerky. Despite the somewhat-gruesome flashback in the middle, it’s a rather heartwarming story, with an uncharacteristic (for Hex at least) happy ending. What Hex doesn’t figure on is the saloon gal -- who feels she owes him for saving her life -- knocking him out, putting on his uniform, and acting as a decoy so Jonah can get away while their captors are focused on her. It’s great plan, really, with the exception of neither of them knowing that the Fort Charlotte Brigade stacked the odds against them and rigged the barbwire perimeter fence to explode, which it did once that poor girl tried to cut through it. 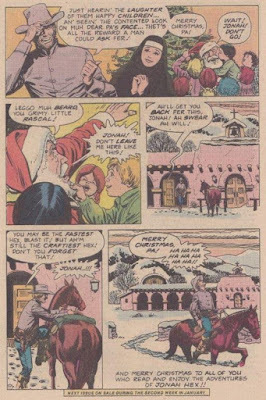 With "Jonah Hex" dead, Turnbull’s goons leave, and the real Jonah escapes right out from under their noses, stopping long enough to bury the woman who saved his life on the outskirts of the old fort. Jonah Hex #37 also deals with Jonah’s Civil War days, telling a tale that reveals Lieutenant Hex to be the soldier who accidentally shot General "Stonewall" Jackson (a odd fact of DCU history that carried over to the post-Flashpoint universe , as there's a throwaway line about it in All-Star Western #19 , over thirty-three years later). 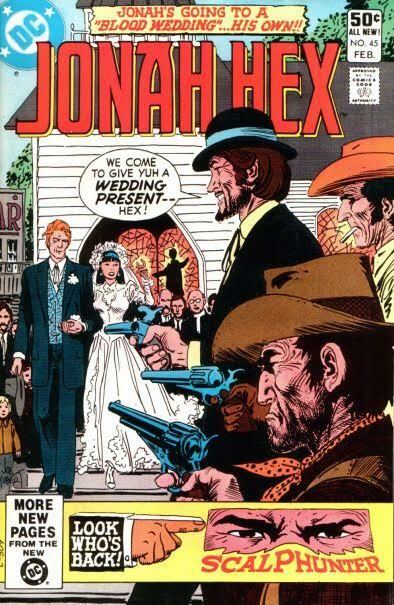 At least there’s something for both Jonah and us to smile about in Jonah Hex #39, because for the first time in six years, Tony DeZuniga is back to draw the character he co-created, and within a few issues, he'll retake his place as the main artist for Jonah's title. 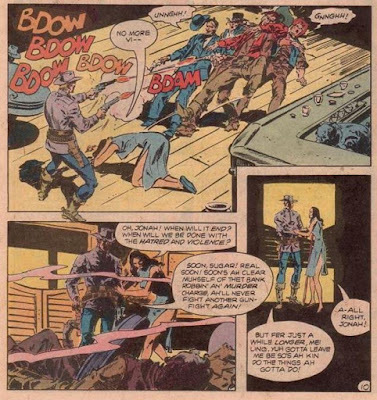 Things weren't so rosy elsewhere that same month, as Weird Western Tales was cancelled with the publication of issue #70, making Jonah Hex the sole Western offering by DC, and one of the last still being published by any comics company (Marvel had cancelled both Kid Colt and Rawhide Kid the previous year, both of which were merely reprint titles by that time). 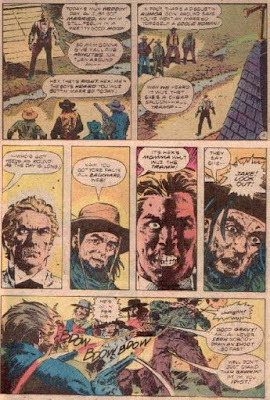 Despite this grim outlook for the genre, Michael Fleisher and artist Gerald Forton were grooming a new Western character for DC, with the intent being to give him his own title. 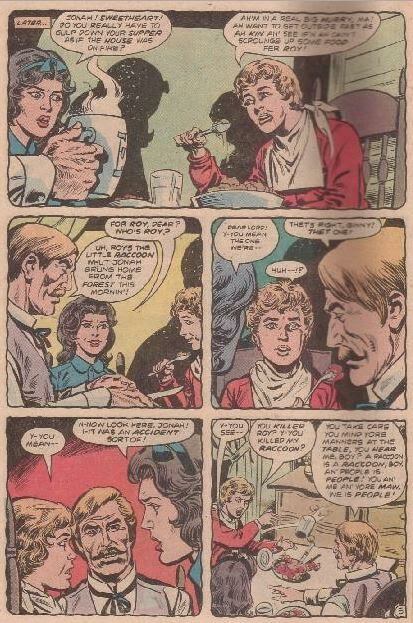 Later on, Jonah and Hart arrange a little subterfuge to trick the mayor and his accomplice into confessing their crimes, thereby allowing the story to end on a happy note, with Jonah and J.D. talking rather amicably, and Mei Ling standing next to Jonah with a loving look in her eyes. Seems our favorite bounty hunter is staying true to his word about retiring, and J.D. wishes the happy couple all the best, though he can’t stay for the wedding. “There’s rumors of another range war brewing up in Lincoln County, and I’m afraid I’ve got to ride up there and poke my big nose in it!” he says, a line that probably alludes to what would've been the first story arc of Hart’s own title had it manifested (years later, Hart will return to become a regular member of Jonah's supporting cast). After the bodies stop falling and the smoke clears, Jonah apologizes to Mei Ling for what he’s done, then asks the banker for the keys to their new house so they can get away from all this. Unfortunately, it looks like that little dream’s been taken from them as well: those gossiping ladies from the dress shop got to the banker first, and demanded that he not sell any property to Jonah, what with him being a "notorious gunfighter and miscegenationist", as they put it. So our hapless banker spins a yarn about the property already being sold and he wasn’t informed. 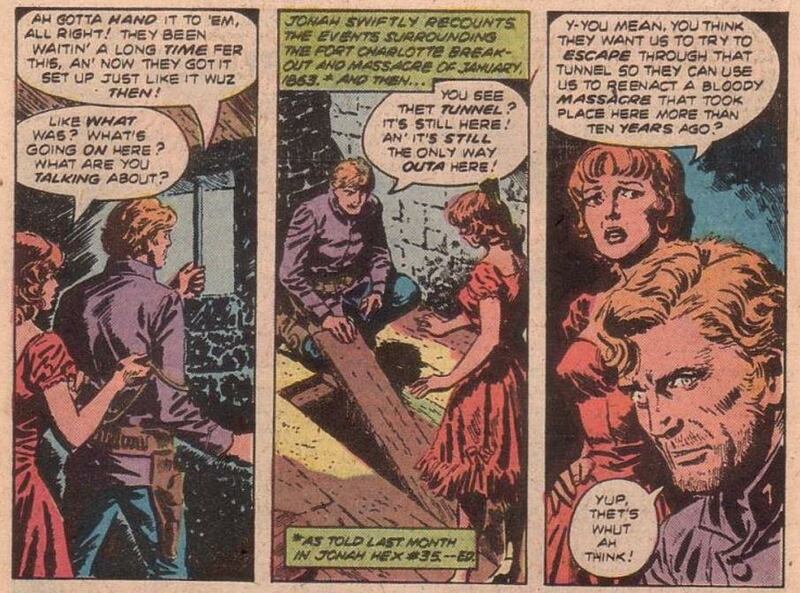 It’s very reminiscent of a scene near the end of All-Star Western #10, right down to Jonah saying to Mei Ling as they leave town, "Ah never really wanted tuh live around here anyhow!" 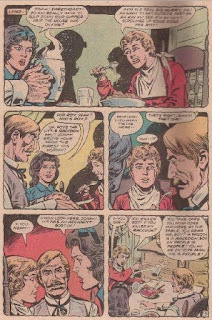 Things haven't improved much by the beginning of Jonah Hex #46 (March 1981), as we learn that our star-crossed couple has spent the last three weeks being turned out of every place they've tried to settle in. "Folks ain’t exactly scurryin' tuh lay out the welcome mat fer a yellow-skinned woman an’ a scarred-up ex-bounty hunter!" Jonah grumbles as they ride their buckboard through the rain towards a roadside inn. 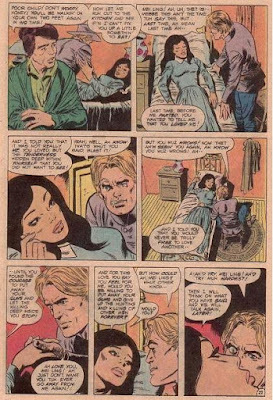 Once there, it’s the same old story, and Mei Ling has to talk Hex out of busting the heads of the racist skunks they run into there. Back on the trail again, one of the wheels on the buckboard jams up and breaks, throwing its passengers violently off. Mei Ling’s okay, but Jonah landed damn-near on his head, putting such a strain on his back that he can barely move. Not long after Mei Ling leaves to find help, their "friends" from the inn spot Hex from afar, and they decide to have a little fun with the "coolie lover". Despite being close to crippled, Jonah manages to take out two of the three men before crawling his way to a nearby abandoned farmhouse, where he eventually takes out the last man with the help of some rotted floorboards, a lot of straw, and a well-placed pitchfork. 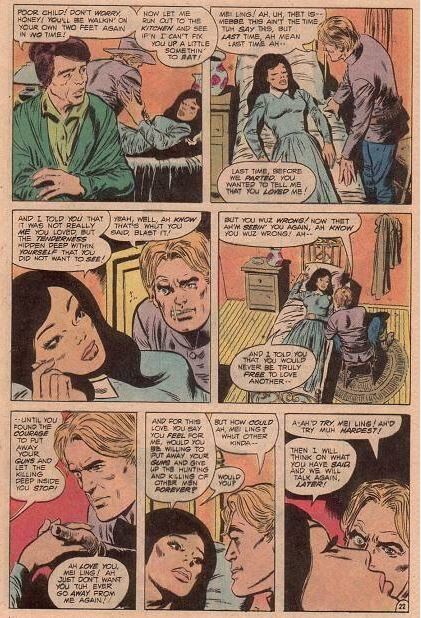 Sometime later, Mei Ling returns with a doctor -- they track Jonah to the house, where the doc informs him that his paralysis is most likely temporary, and a few weeks of bed rest should help him heal up. Laying on a bed within the abandoned house, Jonah mentions that they’re looking for a place to settle, and he’s wondering who owns this particular spread. "As a matter of fact, I own it!" Doc Pedersen says. Seems he bought it off a family that moved to California, "But I’d be more than happy to see two nice young folks like you have it!" And with that, Jonah and Mei Ling finally have a place to call home, and can really begin to enjoy their new life together. In our next installment, Jonah passes two more milestones in his life, plus he learns that marriage isn't all it's cracked up to be.